The 8th meeting of India-Kenya Joint Trade Committee was held in Nairobi, Kenya, from 22nd –25th August, 2018. The meeting was co-chaired by Union Minister of Commerce & Industry and Civil Aviation, Suresh Prabhuand Mr. Peter Munya, Cabinet Secretary (Minister) for Industry, Trade and Cooperatives, Government of Kenya.The discussions during the meetings covered India’s contribution in implementation of Kenya’s Big Four Agenda – food security, affordable housing, universal healthcare and manufacturing, expansion and diversification of bilateral trade, Kenya’s readiness to join the International Solar Alliance, implementation of Lines of Credit, of over US$ 220 million, extended by Government of India in power transmission, SMEs development, revival of theRivatex factory and agricultural mechanization, implementation of decisions taken during the high level exchanges, cooperation in health, blue economy, agro-processing sectors and WTO related issues; and training & capacity building programmes offered by India. An Agreed Minutes of the Meeting was signed by both Ministers. A meeting ofIndia-Kenya Joint Business Council was held on the side-lines of the Joint Trade Committee meeting. In his address to the Kenyan and Indian business leaders, Suresh Prabhu emphasized on research and design in products specific to Kenyan needs and urged Indian businesses to carry out a market study to identify priority areas for bilateral cooperation.The Commerce Minister also interacted with the members of the Indian diaspora and apprised them about the various developmental initiatives and achievements of the Government of India. During the visit, Suresh Prabhu, called on the Kenyan President, Uhuru Kenyatta, and Deputy President, Mr. William Ruto. The Commerce Minister, Suresh Prabhu, was accompanied by senior officials of the Ministry of Commerce & Industry and a business delegation.India and Kenya are Indian Ocean neighbours and share longstanding trade and people-to-people contacts. 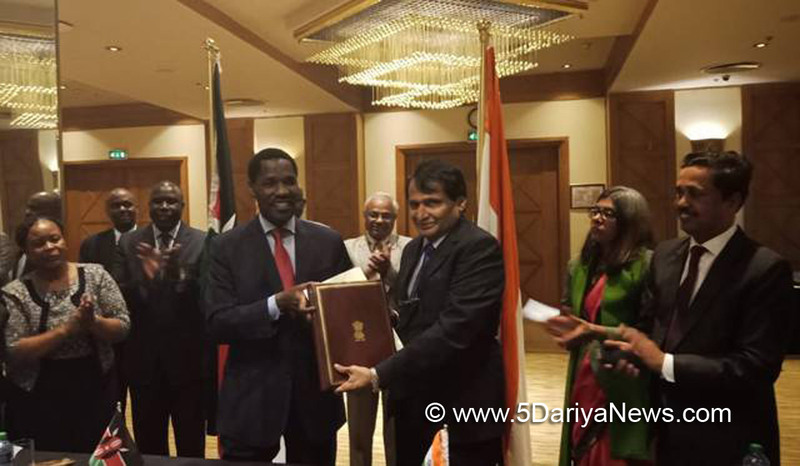 At present, India is one of Kenya's largest trade partners and the second largest foreign investor in Kenya. Indians are the third-largest group of tourists to Kenya. The last meeting of Joint Trade Committee was held in New Delhi in February 2015.